Reed Gunther » Archive » Read REED GUNTHER #7 for FREE! Read REED GUNTHER #7 for FREE! Nice job with getting the Image deal guys! … though personally I’m glad I’ve got the self-published versions! That said; I look forward to seeing these on the shelves. Rock on guys! RG is some great stuff and you deserve all these good things! People seem to be really jazzed for RG! Awesome-sauce! Thanks for the support fellas! @Mike! Thanks for the kind words dude. Hope all is well! We missed ya at San Diego! I just found your beautiful comic today at my local comic store and fell in love with your characters immediately. 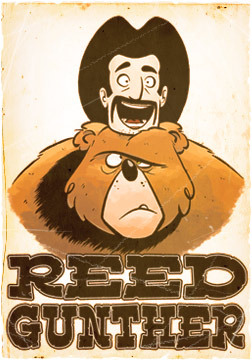 That Reed is one dashing fella! I caught myself laughing out loud several times during my reading of issue #7. Oh man, I’m totally on board (…bear’d)! Great funny moments in issue #7. These covers a great tease to to continuing adventures!